Tell your girlfriend not to worry [about the changes] — those reports have been greatly exaggerated! Of course, the script has to be different from the book in some ways — you have to find a way to externalize all those internal thoughts and you have to do more with less room and you just don’t have room for everything. But the mood, tone and spirit of the book are very much intact. When Gone Girl opens, it's the day of Amy Dunne's (Pike) disappearance (and, coincidentally enough, it's also the day of her 5th wedding anniversary with Affleck's Nick Dunne), but we soon zip back in time to Amy and Nick's first meeting. Initially told from Amy's perspective via her all-important diary, the scene is nothing short of magical (even though the pair meet in a very conventional way), something lifted right out of a fairy tale (well, at least the way Amy tells it). At the time, it's just what Amy needs. Later, of course, the entire thing will take on a much darker cast. Flynn's novel slips between both perspectives (Nick to Amy and back again) and time frames (the present day narrative blends into the past and so on), which makes for some very compelling reading, especially when we experience events through Nick's eyes and then Amy's. When we first learn about the hunts, we get Nick's take on them. And he hates them. Not much later, we get Amy's perspective on not only what she thinks of them (duh, she loves them), but how she goes about planning them. It should come as no surprise that the Dunnes' differing views on the hunts make it clear very early on that the couple is not even remotely on the same page. Even after Amy goes missing, Nick still feels compelled to complete the 5th anniversary hunt she prepared for him. Initially just sort of sad (who goes on an anniversary scavenger hunt when their spouse is missing? ), the hunt soon becomes something very, very different. By the time Nick goes to visit Hannibal, Missouri (a historic township he once visited with Amy, and the home of Mark Twain! ), it becomes clear that something is not quite right. Yes, Amy has some stuff to hide, but guess who else does? Nick. Did you guess Nick? You were so right. It's Nick! About two hundred pages into Flynn's novel, the author throws her readership for a big loop with the reveal that, oops, Nick hasn't been the dedicated husband he's so desperate to make everyone think he is. Who says? His mistress, Andie, who comes stomping on to the scene, seemingly out of nowhere. 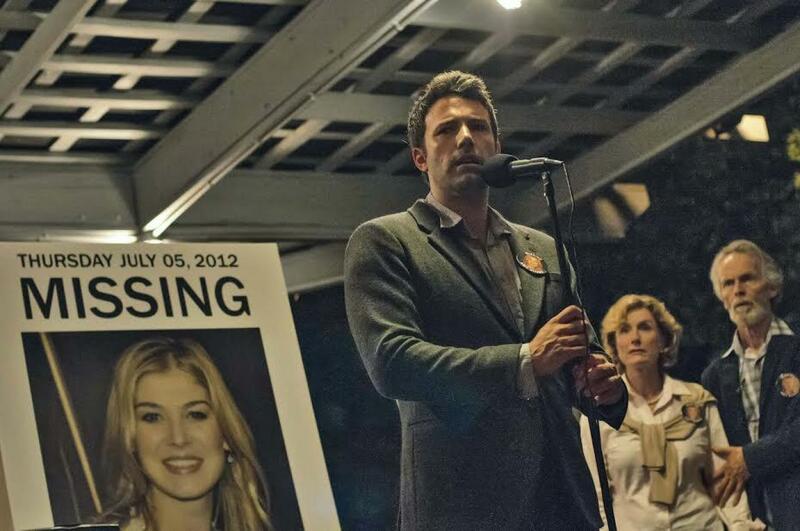 Gone Girl takes a modern approach to Amy's missing person case, placing a large emphasis on the media and how they cover the case (and Nick's increasingly bad behavior). A cable TV host styled after Nancy Grace, the ball-busting Ellen Abbott rips Nick at every chance, and her first show dedicated to the Dunne case is a real eye-opener. With the lovely Missi Pyle on board as Ellen, it sure looks like Fincher isn't backing away from the talking head (and all the insane information she digs up). It becomes steadily evident that Nick knows very little about his wife's activities, including her apparently tight friendship with their neighbor Noelle Hawthorne, who Nick brushes off at nearly every turn. By the book's midpoint, though, that's no longer an option, when Noelle bursts into a press conference and demands to know where Nick's wife is. Where's Nick's pregnant wife is. Oops. He definitely didn't know about that. Flynn's novel includes a very long section where Amy totally breaks down, dismantles, and demolishes the idea of the "Cool Girl." It's one of the best and biggest parts of the entire book — and, man, does it give some big insight into Amy's mindset — and while it's hard to imagine bringing what essentially boils down to a longform diary entry into a narrative feature, it just has to happen in Gone Girl. This is non-negotiable. The scavenger hunt has already turned nefarious by the time Nick finds a pair of marionettes — vintage Punch and Judy dolls — as hidden by Amy, but that doesn't dilute the terrifying power of the creepy puppets when they make their first appearance. It's probably one of the most plainly freaky things to happen in the book, and it will look fantastic on the big screen. Nick's troubles are seemingly insurmountable by the time his team hits on a solid plan: refute all the trashy cable news by granting an exclusive interview to a well-respected journalist that will led him instant credibility. What a great idea! Too bad the entire thing is thrown for a massive loop by a jaw-dropping press conference that features an annoyed Andie, airing Nick's dirty laundry to the entire world. Throughout the book, we learn about various strange characters from Amy's past, people who all seem to be obsessed with her, from childhood friends to jilted boyfriends. Looming large is Desi Collings, her nutty high school boyfriend who just so happens to live in Missouri himself. Convenient, right? Well, once the true nature of Amy's disappearance reveals itself and entangles Desi, it seems like the most important detail in the entire book. Late in the book, a totally alive Amy comes crawling back to Desi looking for help, but soon finds that her plan might actually lead to her (very real) death, because Desi has been planning for Amy, too. Amy eventually deals with Desi, but we only learn about what happened and how she launched her wicked little escape plan via a long-winded explanatory period, thanks to interviews and chats with Nick. We don't actually see this stuff play out in the novel's third act, which might be one of the things that Fincher and Flynn have tweaked for the film. Gone Girl will have its world premiere at the New York Film Festival (where it will serve as the Gotham-based fest's opening night film), with a wide release to follow on October 3.